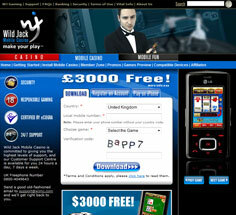 Wild Jack Casino now offers a sleek and full-featured mobile casino to compliment its hugely popular online casino. The mobile version of Wild Jack offers players a stout selection of Spin 3 mobile casino games titles to install on mobile phones, letting them enjoy their favorite games wherever they are – on the bus, at the airport, anywhere! The Spin 3 software used by Wild Jack Mobile Casino is compatible with hundreds of phones, making this mobile casino very accessible. It will work on most modern mobiles with WAP capability and a whole range of smartphones including touch based devices like the iPhone. Setting things up on a specific phone is quick and easy – just enter your phone number at the casino’s website and a text message with a download link will be sent off immediately. Once the software is installed, individual games can be downloaded, letting players only install the ones they want. 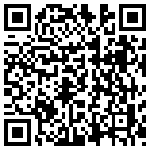 There are 21 games available to download for use with the Wild Jack Mobile Spin 3 software. These come from all sections of a standard casino, and include slots, video poker, table and card games, and more. Some of the more popular titles are Major Millions slot with progressive jackpot, Tomb Raider slot, keno, blackjack, pub fruity, and 3 card poker. The game list is really a “Best Of” list, offering top mobile casino games from all categories that can all be enjoyed right from a player’s phone. 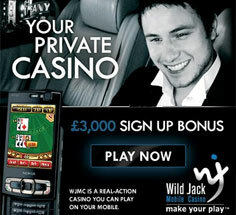 There are some major promotions in store for players at Wild Jack Mobile Casino. First of all, new players are given a wonderful up to $/€/£500 welcome bonus package on their first four deposits. Then, all members are eligible for a special ongoing 10% bonus that is added to all deposits, up to $250 each month – that’s as much as $3,000 in free credits every year! Look for special Player Comps bonuses too, that casino bosses give out to players. There’s also a great Loyalty Program available. Wild Jack Mobile really knows how to treat its players! Overall, Wild Jack Mobile Casino has quite a lot to offer. Their bonuses and promotions are really fantastic for a mobile casino, and the games selection is very good as well. The site supports a large variety of mobile devices so the vast majority of players can enjoy games from this mobile casino.